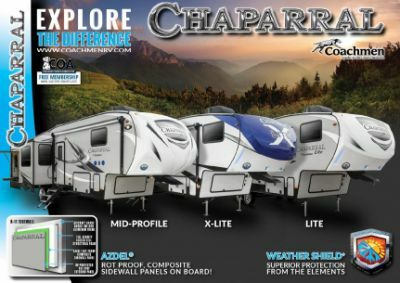 Upgrade from the tent with this 2019 Coachmen Chaparral Lite 29BH! It's an ideal 5th Wheel for camping enthusiasts! Here at TerryTown RV, we offer incredibly low prices on top quality RV brands! It's just one of the reasons why we're one of the top RV dealers in Michigan! See this model and other 5th Wheel RVs on our lot at 7145 Division Ave S Grand Rapids Michigan 49548! Call us at 616-455-5590 to learn more from one of our RV experts! No matter how far you want to go, the reliable Chaparral Lite 29BH will be ready for the road! It has a manageable hitch weight of 1603 lbs, ship weight of 9112 lbs, and a GVWR of 11300 lbs. When you want to lounge outside, just place your camping chairs under the cool shade of the 13' 0" awning! Sleep comfortably in the master bedroom's Queen bed! This 5th Wheel can sleep up to 10 people. Stir up a nice meal for the family in the kitchen! Inside there is a 3 burner range cooktop and a 8.00 cu. ft. refrigerator. The 40 gallon fresh water tank provides enough clean water for the entirety of the trip! Need to rush to the bathroom? 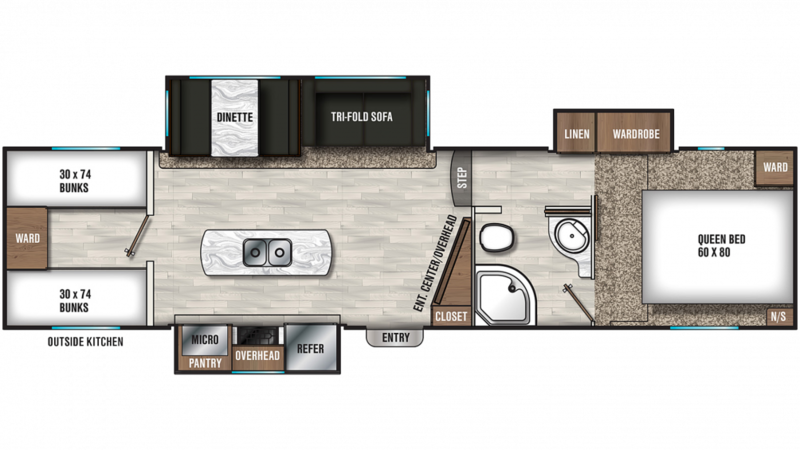 No worries, as this RV has a Foot Flush toilet in the bathroom! You can enjoy long, hot showers throughout your trip with 60 lbs. of LP tank capacity! The used water and waste are stored discreetly in the 66 gallon gray water tank and the 33 gallon black water tank, respectively. Everyone gets a good night's rest inside this cozy camper, which has soft, inviting 5 beds! You'll find extra comfy Quad Bunkbeds for the kids inside the bunkhouse! Family picnics come easy with the help of the outside kitchen!